Occasionally, the Nobel Committee gives a prize that is unexpected, surprising, yet deft in how it points out underappreciated research. This year, they did no such thing. Both William Nordhaus and Paul Romer have been running favourites for the award for many years. The surprise, if anything, is that the prize went to both men together: Nordhaus is best known for his environmental economics; and Romer for his theory of ‘endogenous’ growth. On reflection, the connection between their work is obvious. Both have at their core the longstanding problem of economic growth. Why are some places and times rich and others poor? And what is the impact of these differences? But as each generation became richer than the one before it – at least in a handful of Western countries and Japan – economists began to search more deeply for the reason. Marx saw capital accumulation as the driver. Schumpeter certainly saw innovation (though notinvention, as he always made clear) as important, though he had no formal theory. It was two models that appeared during and soon after the Second World War – those of Harrod-Domar and Solow-Swan-Tinbergen (1942) – which began to make real progress. Consider Solow's model. Economic output is a function of ‘technology’, the capital stock and labour. The capital stock depends on savings and depreciation, labour grows at a constant rate n, and ‘technology’ grows at constant rate g. Solow shows that growth can be decomposed in a regression into observable growth in capital and labour, and unobservable growth in technology. In the US, most growth is driven by the latter factor, what Moses Abramovitz called ‘the measure of our ignorance’ but which we often call ‘technology’ or ‘total factor productivity’. This is in one sense satisfying – we know we grow richer because of something other than growing population or capital per worker. But if technology drives growth, we surely must know what drives technological change. Who wouldn't see the massive corporate R&D facilities of the post-war era throwing out inventions like the transistor and not think: surely technology improvements are endogenous, meaning ‘from within’, to the profit-maximising choices of firms? What affects the incentives for firms to spend fixed costs developing inventions that spill over to other firms and economic growth at large? And another question: if technology – productivity itself! – is endogenous, then ought we to consider not just the positive externality that spills over to other firms, but also the negative externality of pollution, especially climate change, that new technologies both induce and help fix? Finally, if we know how to incentivise new technology and how growth harms the environment, what is the best way to mitigate the great environmental problem of our day, climate change, without stopping the wondrous increase in living standards that growth keeps providing? It is precisely for helping answer these questions that Romer and Nordhaus won the Nobel. Let us start with Paul Romer. You know you have knocked your Ph.D. thesis out of the park when the great economic journalist David Warsh (2006) writes an entire book hailing your work as ‘solving the oldest puzzle in economics’. The two early Romer papers, published in 1986 and 1990, have each been cited more than 25,000 times, which is an absolutely extraordinary number by the standards of economics. Romer's achievement was writing a model where inventors spend money to produce inventions with increasing returns to scale, other firms use those inventions to produce goods and a competitive Arrow-Debreu equilibrium still exists. If we had such a model, we could investigate what policies a government might wish to pursue if it wanted to induce firms to produce growth-enhancing inventions. Writing a model of this type proved extraordinarily challenging. Let's be more specific. First, innovation is increasing returns to scale because ideas are non-rival. If I double the amount of labour and capital, holding technology fixed, I double output; but if I double technology, labour and capital, I more than double output. That is, give one person a hammer and they can build, say, one staircase a day. Give two people two hammers and they can build two staircases by just performing exactly the same tasks. But give two people two hammers and teach them a more efficient way to combine nail and wood, and they will be able to build more than two staircases. That ‘recipe’ on how to build staircases, once invented, can be passed along to every other inventor at much lower cost than what it would take to create the initial invention. Second, recall that in a competitive economy, factors of production like capital and labour are paid their marginal product. If production is constant returns to scale in capital and labour, then the wage bill and capital rent combine to equal the entire value of output – nothing is left as profit, but also nothing is left over to pay for the ‘recipe’ that made capital and labour more efficient. That is, the realisation that a single invention improves productivity for all is an old one; as Thomas Jefferson wrote in 1813, ‘[h]e who receives an idea from me, receives instruction himself without lessening mine; as he who lights his taper at mine, receives light without darkening me.’ But the difficulty is figuring out how to get these positive spillovers yet still have ‘prices’ or some sort of rent for the invention. Otherwise, why would anyone spend money to invent in the first place? Third, we need to ensure that growth is not ‘too fast’ in our model. There is a stock of existing technology in the world. I use that technology to create new innovations that grow the economy. With more people over time and more innovations over time, you may expect the growth rate to be higher in bigger and more technologically advanced societies. It is in part, as Michael Kremer (1993) points out in his “One Million B.C. to 1990” paper. Nonetheless, the rate of growth is not asymptotically increasing by any stretch – see, for example, Ben Jones (2009) on this point. Indeed, growth is nearly constant, abstracting from the business cycle, in the US, despite a big growth in population and the stock of existing technology. Romer's first attempt at endogenous growth was based on his thesis and published in the Journal of Political Economy in 1986. Here, he adds ‘learning-by-doing’ to Solow – technology is a function of the capital stock, so as a given firm uses more capital, they generate more learning, which spills over to other firms. Even if population is constant, with appropriate assumptions on production functions and capital depreciation, capital, output and technology grow over time. There is a problem here, however, and one that is common to any model based on learning-by-doing which partially spills over to other firms. As Dasgupta and Stiglitz (1988) point out, if there is learning-by-doing which only partially spills over, the industry is a natural monopoly. And even if it starts competitively, as I learn more than you, dynamically I can produce more efficiently, lower my prices and take market share from you. A decentralised competitive equilibrium with endogenous technological growth is unsustainable! Back to the drawing board, then. We want firms to produce technology intentionally in a competitive market as they would other goods. We want technology to be non-rival. And we want technology production to lead to growth. Learning-by-doing allows technology to spill over, but would simply lead to a monopoly producer. Pure constant returns to scale competitive production, where technology is just an input like capital produced with a ‘non-convexity’ – only the initial inventor pays the fixed cost of invention – means that there is no output left to pay for invention once other factors get their marginal product. A natural idea, well known to Arrow (1962) and others, emerges: we need some source of market power for inventors. But, of course, we want to leave the world of perfect competition as little as possible. Romer's insight is that inventions are non-rival, yes, but they are also partially excludable, via secrecy, patents or other means. In his blockbuster 1990 Journal of Political Economy paper, “Endogenous Technological Change”, he lets inventions be given an infinite patent, but also be partially substitutable by other inventions, constraining prices. The idea here draws on a Spence-style monopolistic competition model, with free entry ensuring that inventors still earn zero profit after paying for R&D. The more inventions there are, the more efficiently final goods can be made. Future researchers can use present technology as an input to their invention for free. Invention is thus partially excludable in the sense that my exact invention is ‘protected’ from competition, but also spills over to other researchers by making it easier for them to invent other things. Inventions are therefore neither public nor private goods; they are also not ‘club goods’ (non-rival but excludable) since inventors cannot exclude future inventors from using their good idea to motivate more invention. From the perspective of final goods producers, there are just technologies I can license as capital inputs, which I then use in a constant returns to scale way to produce goods, as in Solow. Every factor is paid its marginal product, but inventions are sold for more than their marginal cost due to monopolistic excludability from secrecy or patents. The model is general equilibrium and it gives a ton of insight about policy – for example, if you subsidize capital goods, do you get more or less growth? In Romer (1986), where all growth is learning-by-doing, cheaper capital means more learning means more growth. In Romer (1990), capital subsidies can be counterproductive! There are some issues to be worked out: the Romer models still have ‘scale effects’ where growth is not constant, roughly true in the modern world, despite changes in population and the stock of technology (see Chad Jones' 1995 and 1999 papers). The neo-Schumpeterian models of Aghion-Howitt (1992) and Grossman-Helpman (1991) add the important idea that new inventions don't just add to the stock of knowledge, but also make old inventions less valuable. And really critically, the idea that institutions and not just economic fundamentals affect growth – meaning laws, culture, and so on – is a massive field of research at present. But it was Romer who first cracked the nut of how to model invention in general equilibrium, and I am unaware of any later model that solves this problem in a more satisfying way. So we have, with Romer, a general equilibrium model for thinking about why people produce new technology. The connection with Nordhaus comes in a problem that is both caused by, and potentially solved by, growth. In 2018, even an ignoramus knows the terms ‘climate change’ and ‘global warming’. This was not at all the case when William Nordhaus began thinking about how the economy and the environment interrelate in the early 1970s. Growth as a policy goal was fairly unobjectionable in 1960: indeed, a greater capability of making goods and making war, seemed a necessity for both the free and Soviet worlds. But by the early 1970s, environmental concerns arose. The Club of Rome warned that we were going to run out of resources if we continued to use them so unsustainably: resources are of course finite and there are therefore ‘limits to growth’ (Meadows et al. 1972). Beyond just running out of resources, growth could also be harmful because of negative externalities on the environment, particularly the new-fangled idea of global warming an MIT report warned about in 1970 (Study of Critical Environmental Problems 1970). Nordhaus treated those ideas both seriously and sceptically. In a 1974 American Economic Review paper, he notes that technological progress or adequate factor substitution allow us to avoid ‘limits to growth’. To put it simply, whales are limited in supply and hence whale oil is as well, yet we light many more rooms than we did in 1870 due to new technologies and substitutes for whale oil. Despite this scepticism, Nordhaus does show concern for the externalities of growth on global warming, giving a back-of-the-envelope calculation that along a projected Solow-type growth path, the amount of carbon in the atmosphere will reach a dangerous 487ppm by 2030, surprisingly close to current estimates. A contemporaneous essay with Tobin (Nordhaus and Tobin 1972) and a review of an environmentalist's ‘system dynamics’ predictions of future economic collapse (Nordhaus 1973a) reache a similar conclusion: substitutable factors mean that running out of resources is not a huge concern, but rather the exact opposite, that we will have access to and use too many polluting resources, should worry us. That is tremendous foresight for someone writing in 1974! We ought to pause to reflect on Nordhaus' ability to be sceptical of economic nonsense coming from the Club of Rome and their promoters, while still sounding the alarm about true environmental problems where economics could contribute to a solution. There were widespread predictions, from very serious people, that growth would not just slow but reverse by the end of the 1980s due to ‘unsustainable’ resource use. Instead, GDP per capita has nearly doubled since 1990, with the most critical change coming for the very poorest. Just as we can refute Club of Rome worries with serious economics, so too can we study climate change. The economy affects the climate and the climate affects the economy. What we need is an integrated model to assess how economic activity, including growth, affects production of carbon dioxide and therefore climate change, allowing us to back out the appropriate Pigouvian carbon tax. This is precisely what Nordhaus did with his two celebrated ‘integrated assessment models’ (IAMs), which built on his earlier simplified models (for example, 1975's “Can We Control Carbon Dioxide?”). These models have Solow-type endogenous savings and make precise the trade-offs of lower economic growth against lower climate change, as well as making clear the critical importance of the social discount rate and the micro-estimates of the cost of adjustment to climate change. The latter goes well beyond the science of climate change holding the world constant: the Netherlands, in a climate sense, should be underwater, but they use dykes to restraint the ocean. Likewise, the cost of adjusting to an increase in temperature is something to be estimated empirically. Nordhaus (2007) takes climate change very seriously, but he is much less concerned about the need for immediate action than the famous Stern (2006) report, which takes fairly extreme positions about the discount rate (1,000 generations in the future are weighed the same as us, in Stern) and the costs of adjustment. 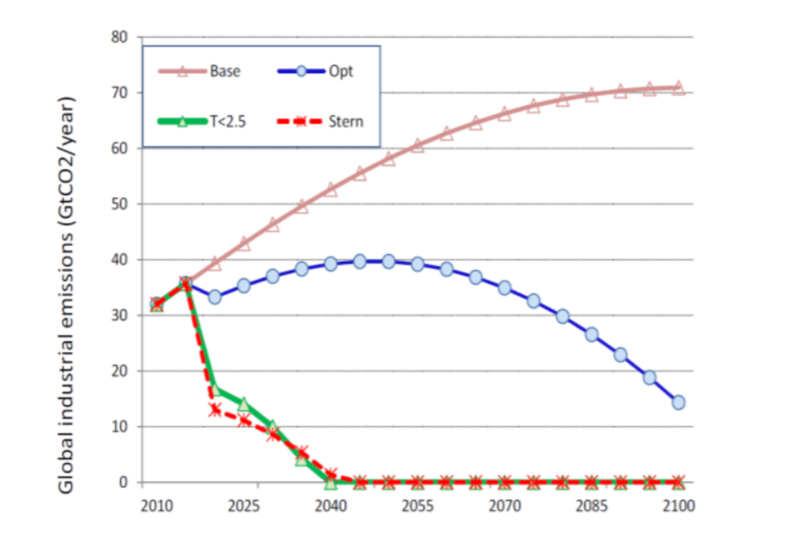 Consider the following ‘optimal path’ for carbon from Nordhaus' most recent run of the model, where the blue line is his optimum. Note that he permits much more carbon than Stern or a policy that mandates temperatures staying below a 2.5C rise forever. The reason is the costs to growth in the short term are high: the world is still very poor in many places! There was a vitriolic debate following the Stern report about who was correct – whether the appropriate social discount rate is zero or something higher is a quasi-philosophical debate going back to Ramsey (1928). But you can see here how important the calibration is. There are other minor points of disagreement between Nordhaus and Stern, and my sense is that there has been some, though not full, convergence of their beliefs about optimal policy. Some have rightly quibbled with Nordhaus' optimism about welfare being maximised in a world with climate change far exceeding the IPCC-recommended limits. But there is no disagreement whatsoever between the economic and environmental community that the appropriate way to adjudicate the optimal response to climate change is via an explicit model incorporating some sort of endogeneity of economic reaction to climate policy. The power of the model is that we can be extremely clear about what points of disagreement remain, and we can examine the sensitivity of optimal policy to factors like climate ‘tipping points’. There is one other issue: in Nordhaus' IAMs and in Stern, you limit climate change by imposing cap and trade or carbon taxes. But carbon harms cross borders. How do you stop free riding? Nordhaus, in a 2015 American Economic Reviewpaper, shows theoretically that there is no way to generate optimal climate abatement without sanctions for non-participants, but that relatively small trade penalties work quite well. This is precisely what Emmanuel Macron is currently proposing! Let's wrap up by linking Nordhaus even more tightly back to Romer. It should be noted that Nordhaus was very interested in the idea of pure endogenous growth, as distinct from any environmental concerns, from the very start of his career. His thesis was on the topic (leading to a proto-endogenous growth paper in the American Economic Review in 1969), and he wrote a sceptical piece in the Quarterly Journal of Economics (1973b) about the then-leading theories of what factors induce certain types of innovation (objections that have been fixed by Acemoglu 2002). Like Romer, Nordhaus has long worried that inventors do not receive enough of the return to their invention and that we measure innovation poorly – see his classic NBER chapter (1996) on inventions in lighting and his (2005) attempt to estimate how much of society's output goes to innovators. The connection between the very frontier of endogenous growth models and environmental IAMs has not gone unnoticed by other scholars. Nordhaus’ IAMs tend to have limited incorporation of endogenous innovation in dirty or clean sectors. But a fantastic paper by Acemoglu et al. (2012) combines endogenous technical change with Nordhaus-type climate modelling to suggest a middle ground between Stern and Nordhaus: use subsidies to get green energy close to the technological frontier, then use taxes once their distortion is relatively limited because a good green substitute exists. Indeed, since this paper first started floating around eight or so years ago, massive subsidies to green energy sources like solar by many countries have indeed made the ‘cost’ of stopping climate change much lower than if we'd relied solely on taxes, since now production of very low-cost solar power and mass market electric cars is in fact economically viable. It may indeed be possible to solve climate change – what Stern called ‘the greatest market failure’ man has ever seen – by changing the incentives for green innovation, rather than just by making economic growth more expensive by taxing carbon. Going beyond just solving the problem of climate change, to solving it in a way that minimises economic harm, is a hell of an accomplishment, and more than worthy of the Nobel prizes Romer and Nordhaus won for showing us this path! Paul Romer himself has a nice essay on ‘climate optimism’ and the extent to which endogenous invention matters for how we stop global warming. On why anyone signs climate change abatement agreements, instead of just free riding, see the clever incomplete contracts insight of Battaglini and Harstad (2016). Romer has also been greatly interested in the policy of ‘high-growth’ places, pushing the idea of ’charter cities’. Charter cities involve Hong Kong-like exclaves of a developing country where the institutions and legal systems are farmed out to a more stable nation. Totally reasonable, but in fact quite controversial: a charter city proposal in Madagascar led to a coup, and one can easily imagine that the charter city controversy delayed Romer's well-deserved Nobel laurel. The New York Times points out that Nordhaus' brother helped write the Clean Air Act of 1970. Finally, as is always true with the Nobel, the official scientific summary is lucid and deep in its exploration of the two winners' work. Acemoglu, D (2002), ‘Directed Technical Change’, Review of Economic Studies 69(4): 781-809. Acemoglu, D, P Aghion, L Bursztyn, and D Hemous (2012), ‘The Environment and Directed Technical Change’, American Economic Review 102(1): 131-66. Aghion, P, and P Howitt (1992), ‘A Model of Growth Through Creative Destruction’, Econometrica 60(2): 323-51. Arrow, K (1962), ‘The Economic Implications of Learning by Doing’, Review of Economic Studies 29 (3): 155-173. Battaglini, M, and B Harstad (2016), ‘Participation and Duration of Environmental Agreements’, Journal of Political Economy 124(1): 160-204. Dasgupta, P, and J Stiglitz (1988), ‘Learning-by-Doing, Market Structure and Industrial and Trade Policies’, Oxford Economic Papers 40(2): 246-68. Grossman, G M, and E Helpman (1991), ‘Quality Ladders in the Theory of Growth’, Review of Economic Studies 58 (1): 43-61. Jones, B (2009), ‘The Burden of Knowledge and the Death of the Renaissance Man: Is Innovation Getting Harder?’, Review of Economic Studies 76(1): 283-317. Jones, C (1995), ‘R&D-Based Models of Economic Growth’, Journal of Political Economy 103(4): 759-84. Jones, C (1999), ‘Growth: With or Without Scale Effects?’, American Economic Review 89(2): 139-44. Kremer, M (1993), ‘Population Growth and Technological Change: One Million B.C. to 1990’, Quarterly Journal of Economics 108(3): 681-716. Meadows, D H, D L Meadows, J Randers and W H Behrens III (1971), The Limits to Growth, Potomac Associates. Nordhaus, W (1969), ‘An Economic Theory of Technological Change’, American Economic Review 59(2): 18-28. Nordhaus, W (1973a), ‘World Dynamics: Measurement Without Data’, Economic Journal 83 (332): 1156-83. Nordhaus, W (1973b), ‘Some Skeptical Thoughts on the Theory of Induced Innovation’, Quarterly Journal of Economics 87(2): 208-19. Nordhaus, W (1992), ‘Lethal Model 2: The Limits to Growth Revisited’, Brookings Papers on Economic Activity 23(2): 1-60. Nordhaus, W (1996), ‘Do Real-Output and Real-Wage Measures Capture Reality? The History of Lighting Suggests Not’, in The Economics of New Goods, National Bureau of Economic Research. Nordhaus, W (2005), ‘Schumpeterian Profits and the Alchemist Fallacy’, Yale Economic Applications and Policy Discussion Paper No. 6. Nordhaus, W (2007), 'A Review of the Stern Review on the Economics of Climate Change’, Journal of Economic Literature 45(3): 686-702. Nordhaus, W (2015), ‘Climate Clubs: Overcoming Free-Riding in International Climate Policy’, American Economic Review 105(4): 1339-70. Nordhaus, W, and J. Tobin (1972), ‘Is Growth Obsolete?’, in Economic Growth: Fiftieth Anniversary Colloquium V, National Bureau of Economic Research, Columbia University Press. Ramsey, FP (1928), ‘A Mathematical Theory of Saving’, Economic Journal 38(152): 543-59. Romer, PM (1986), ‘Increasing Returns and Long-run Growth’, Journal of Political Economy 94(5): 1002-37. Romer, PM (1990), ‘Endogenous Technological Change’, Journal of Political Economy 98(5): 71-102. Stern, N H, S Peters, V Bakhski, A Bowen, C Cameron, S Catovsky, D Crane, S Cruickshank, S Dietz, N Edmondson, S-L Garbett, L Hamid, G Hoffman, D Ingram, B Jones, N Patmore, H Radcliffe, R Sathiyarajah, M Stock, C Taylor, T Vernon, H Wanjie, and D Zenghelis (2006), Stern Review: The Economics of Climate Change, Cambridge University Press. Study of Critical Environmental Problems (1970), Man's Impact on the Global Environment: Assessment and Recommendations for Action, MIT Press. Warsh, D (2006), Knowledge and the Wealth of Nations: A Story of Economic Discovery, WW Norton.